I feel like Shelli of Hairscapades now. I knew my hair grew, but I didn’t think it was THAT much. Had I made my length check t-shirt ages ago when I bought the supplies, I would be able to give an accurate record of how much my hair has grown over the last 10 months. I know Michelle hates it when I trim my hair, but honestly, I only trim a smidgen off. I do it myself because I can control how much or little hair I take off. You know when you ask someone else to trim it, you always end up with a cut. If I take off too much, there’s no one to blame but myself. I know many naturals don’t trim their hair, but for me personally, trimming is the key to hair growth. 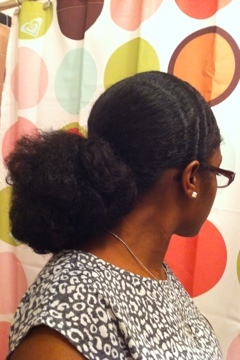 This was evident from my relaxer days. When I first cut off my relaxed ends, I didn’t trim it for a few months because I was scared to lose anymore length than I had already sacrificed. I probably caused more damage by not trimming. My hair grew, but not as much as it appears to be growing now. Once I got comfortable with the length of my hair, I started to trim it more frequently… and by frequently, I mean every 6 weeks or so. I didn’t trim my hair nearly as much when it was relaxed, but in order for me to keep up with these pesky single strand knots (ssk’s), this is apparently what I have to do. So, don’t be afraid of the scissors. You just might be surprised. Here’s a side by side comparison of 10 months of growth. My hair is wet in the first pic and dry in the second. Uh-huh!!!! See??! LOL!!! That’s like, “Whoah!” Do you only trim your hair when you blow it out Rece or do you do it when it’s curly too? You know me, I’m kind of afraid to do a full trim. 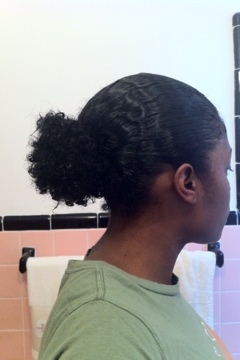 So, I just constantly trim splits and knots every wash day or whenever it is out. But, I’d like to be able to trim it more evenly and all over.